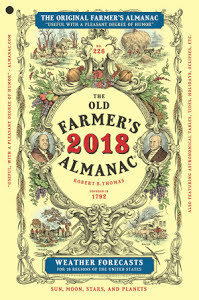 I've always had a soft-spot for the, "Old Farmer's Almanac." I am not a farmer so I don't benefit from the complex graphs about planting seasons, calculating sunrises or sunsets, and the like. I also like to see how accurate its weather predictions are so I bought the 2018 edition as the 2019 one starts hitting stores. I enjoyed the assorted fun articles on random subjects though such as little tidbits about the US-Canada border, Woodchucks, National trends, and reading a special report on expanding diversity in the field of farming. The main reason I got this older one though was to check the weather accuracy, and I continue to be impressed by the (top-secret) method the Almanac uses to call the weather with an accuracy that trends at 80%. It predicted we would get snow in Mid-November around Eastern-Missouri and sure enough there was a rare November snowstorm on the 15th that cancelled schools. The, "Old Farmer's Almanac," has jokes, recipes, and otherwise always is a good read. I'm excited to buy the 2019 edition that is available in stores now and check out what predictions it holds for our weather in addition to fun articles and facts.